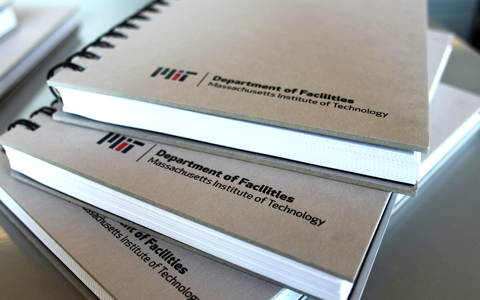 The Department of Facilities approached us to reassess and realign their branding. The goal: to promote cohesiveness among the department’s various groups and convey alignment with the MIT brand. Since the Department of Facilities is composed of many subbrands, we met with the project team to determine which groups required branding and to learn which types of design files they needed. We prepared MIT master branding options for review and created a custom downloads page for the selected files. We provide master-branded logo files at no cost for use in web, Microsoft Office applications, social media, and digital and offset printing. The use of master branding resolved logo production issues and has improved awareness of the department name. The logo is now incorporated throughout several communication tools, including the department’s website, collateral, presentation decks, maps, and forms. The new identity can also be found on staff apparel and uniforms, and it will soon be placed on all Facilities vehicles.